Amade’s Story - Planet Aid, Inc.
During my visit to Mozambique earlier this year, I had the privilege of being guided by a young man named Amade, who took me to visit Planet Aid–supported projects in various parts of the country. Amade is on the staff of the nonprofit development agency ADPP Mozambique — Planet Aid’s project partner. Amade helped me obtain answers to my questions, finessed my interactions with locals, and personally introduced me to Mozambican life, which included everything from how to eat fried fish (“do not disregard the head” he told me) to evening games of eight-ball in a thatch-roofed pool hall. Amade’s parents had separated long before and both had remarried. After his father died, Amade continued living with his stepmother for a time but soon went to live with his mother. His mother had three children at her house, two step-brothers and one step-sister. Not long after Amade arrived at his mother’s house, his stepfather died from a prolonged illness. Children’s Town is a project run by ADPP Mozambique. It provides orphans and disadvantaged children of single-parent families with a safe living and learning environment. Amade lived in Children’s Town for four years and finished primary school there. “For me it was like the light on the end of the tunnel, having that opportunity to continue my education,” he said. 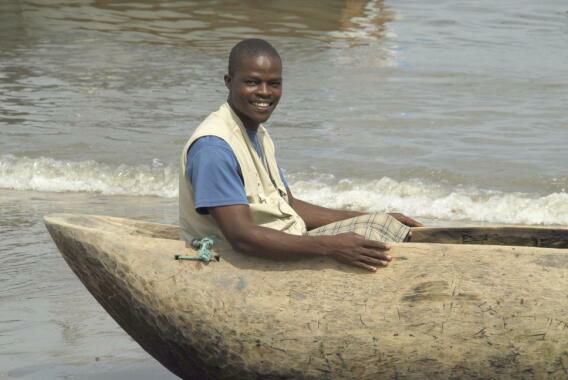 After completing the vocational program, Amade continued his schooling. He enrolled at ADPP’s teacher-training college in Maputo, and finished the program in the requisite 2.5 years. However, he could not find employment as a teacher due to the economic conditions at the time. Recognizing the talent of this bright young man, ADPP offered Amade the job of publicity officer. He described how his income helps support his mother and step-brothers and sister, which live with him in a small house in Maputo. The job also gave him the chance to develop a passion for photography and videography. But that is not the limit of Amade’s ambition. Last year he began an undergraduate program at the Alberto Chipande High Institute of Science and Technology at theUniversidade Eduardo Mondlane in Maputo, where he is studying Justice Sciences and Criminal Investigation. “I have chosen this course because I have this commitment to help people in my country, to help to build justice and peace for people who are suffering without any support,” he said. Amade humbly insists that his life story is not unusual, and that there are many others like himself with similar stories. Life in Africa is difficult and the struggle to rise from poverty ever-present. ADPP has been assisting children like Amade for over 30 years. Many have found refuge and hope for the future in the classrooms and dormitories of the ADPP campuses established across the nation, or through the other programs that it has been implementing. The organization is well-known as a development leader in the country and for its commitment to create lasting change. For more information visit the ADPP website at adpp-mozambique.org.